Whatever the business term is for a business that’s smaller than a small business, that’s what FayFoto Boston is. We have a full-time staff of three. However, even three is a lot more complicated than one when it comes to saving, retrieving, and sharing information each of us know individually. We have many of the same needs as any of our larger small business colleagues. We just don’t have the resources for enterprise-level solutions. Consequently, to keep chaos at bay we have developed numerous DIY solutions. In other words… instead of telling our clients what they can have, our clients tell us what they need. And it’s on us to deliver that repeatedly and consistently. Because repeat business keeps us alive, and because we position FayFoto as frictionless to work with. In a crowded market of talented photographers, that’s our point of differentiation. We have to keep track of client preferences, because that’s why they call us back. But memories have limits, and are hard to share. Many of our clients only need our services two or three times a year. At a certain point we realized it was inefficient to always look up files from previous assignments, and risky to rely on memory. I settled on a wiki as the easiest and most reliable way to collect and update our shared knowledge base, and to make it available to the staff. 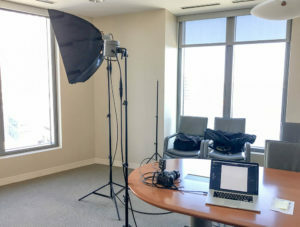 I can easily type into a wiki to add or modify content, but I can also include a photo of a lighting set up (shown in the illustration), or an example of an ideal crop, or even a PDF supplied by the client’s branding team. Everything we know about what a client expects to receive is in one place, and searchable. Because our company’s information is a valuable asset, I chose to use DokuWiki, because it is reasonably easy to self-host on a simple consumer-grade computer. I serve it over localhost on a Mac Mini computer. At first it was only exposed to the local network within our office. But there are times when I need a nugget of information while on an assignment, so I ultimately opened a port on our router to make it accessible over the internet. As with all things DIY, there are risk/benefit considerations. The cons include needing to know how to set up a web server locally, and being responsible for security and backups. (DokuWiki doesn’t rely on a database, so backups aren’t very complex.) The primary advantage is that you own your information, and therefore aren’t at the mercy of a service which might at some point cease to exist. As the primary nerd in our little shop, the chore of maintaining and updating the wiki falls mostly on me. But as the individual responsible to much of our post production – oh my, I can’t tell you how valuable having a tool like this is. If you manage a small small business and struggle to keep many client preferences organized and accessible, a wiki (self-hosted or otherwise) might be the solution you need. If all you know about wikis are wikipedia or wikileaks, I encourage you to investigate the unique data structuring format. It may feel awkward at first but after a while you’ll find it’s really easy to use, and really helpful to have all your institutional knowledge at your, and your staff’s, fingertips.